Wait a minute this isn’t Magic the Gathering…. This is what you might be thinking, as that is what I’ve been writing about here on Lonegamers. But alas this article won’t be about MTG. Wait why not?!?! Well Johnny and Timmy to be honest I haven’t been playing much MTG as of late. It’s reached a stale point for me in Standard which is what my local FNM plays. Ever since Innistrad my interest in the game has dwindled a bit. Right now there are no cards or decks that have me aching to play the game. But don’t worry I will still be providing MTG content here and also on my Youtube. Most of it maybe MTGO content but I’m still going to try to get Gameplay videos and of course still write about it here. 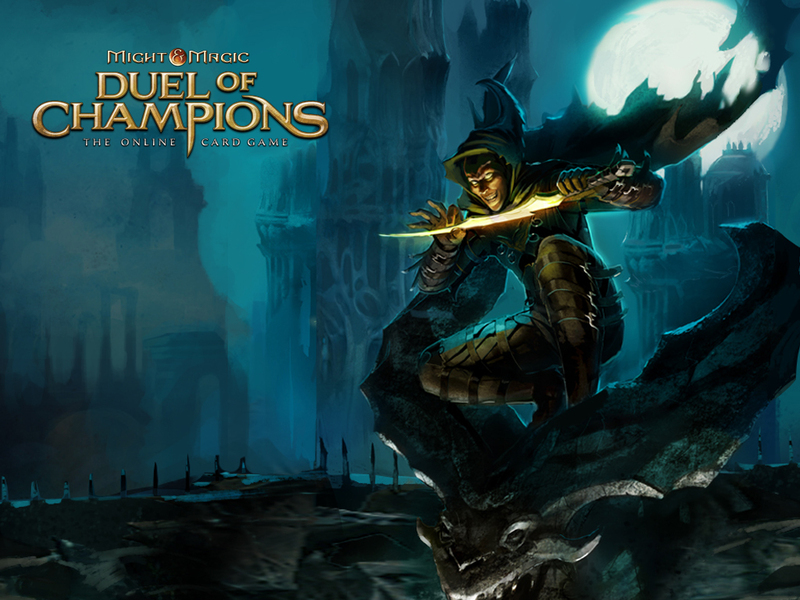 But what I want to talk about today is Might and Magic: Duel of Champions. I’ve been trying to get into Hearthstone beta but no luck and Sol Forge looks neat but I just haven’t been willing to get into it. I was browsing on Steam looking at the free games and I found a gem. Yes it was DoC. This is a free card game! Yes FREE!!! Of course they have options to put money into the game to get tokens to buy more packs and grow your collection. You may be thinking it’s a pay to win model but it’s really not. I started off 12-0 just from all the free packs and cards I got from doing the campaign. It’s fairly easy to pick up if you have played any paper or online TCG. I like to call it a mix of Sol Forge and Magic the Gathering. You have lines and rows to play your creatures. All your spells have a resource cost. It also has a bit of the World of Warcraft TCG mixed in, being that you have a Hero card. Your Hero cards, for the most part, all have slightly different abilities. There are 6 different factions which can be compared to the colors of magic, for the most part. Each has their own theme. There are also neutral cards, which can be used with any of the factions. After you do the tutorial the game gives you an option to pick a started deck of the faction you like. I went with the Necropolis starter. I’d say they are very similar to black in MTG. With lots of Zombie type creatures and some of them have Infect ability. On top of the Factions each here has a number of classes of spellsthey can use. Here there are 7 types: Light, Dark, Air, Earth, Water, Fire, and Primal. If a hero has Fire and Dark as there Class type they can only use spells from those classes. With the combinations of Faction and class type there is quite the variety of decks you can build. As you play you earn gold and seals which then you can buy backs with. These packs have a chance to have a wildcard token. The wildcard tokens can be exchanged for single cards in the Altar of Wishes. This is like there little store shop type area where you can buy singles. You have to have certain about of cards in total from a set before you can buy singles from that set, which I’m not a big fan of. I do like the overall feature of wildcards and this style of marketplace. It helps put things on an even playing field. A person with lots of money could just buy any card in other games but now with this set up if you earn your packs gain wildcards you can purchase singles free of charge. This helps keep the game free and gives you something to play for. Again you can purchase gold and seals to buy packs which give you more access to wildcards to speed the process along but you don’t have to. Another feature I like is the rating system. As you play and win your rating increase which is fairly standard. But the part I like most is you are only put in Swiss events or 1 v 1 duels versus players of similar ratings so you don’t have to worry about starting up and playing against a guy with a high rating and full collection. This helps you ease into the game and build your collection. A very smart move on their part. Now I’ve only been playing for a week and a half so I’m still learning the game and the ins and outs, but I’m having a blast. I haven’t had this much fun playing a TCG in a few years. Its new its fresh and it’s a ton of fun without emptying my wallet. I’ve streamed the game a couple times and will continue doing so, most likely on Mondays. So keep your eyes open, especially on Twitter, to see when my stream goes up. I’ll most likely write more articles and post deck lists and go a little more in-depth on the game once I have a bit more understanding though. In the mean time you can take a look at the game yourself. Hey it’s FREE!!!! Try it out you don’t have anything to lose.